LDL (learning design language) is an educational modeling language which was conceived to model collaborative activities. It has roots in social sciences, mainly linguistics, sociology and ethnomethodology. 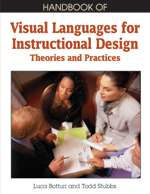 It proposes seven concepts that allow instructional designers to build the model of a collaborative learning activity. It has both a visual and a textual notation, the latter being computer-readable. This means that the produced models can be easily operationalized and executed in an existing virtual learning environment. This chapter introduces LDL, its concepts and the graphical notations associated with each of them. The methodology proposed to facilitate the modeling is also presented. Its use is illustrated by the example of the planet game, which was practically tested with other research teams as a benchmark/competition during the ICALT 2006 conference.